2 Bedroom Detached House For Sale in Ashford for Guide Price £150,000. Mann are excited to welcome to the market CHAIN FREE this immaculate conditioned two bedroom park home. Located in the popular Longbeech Park. 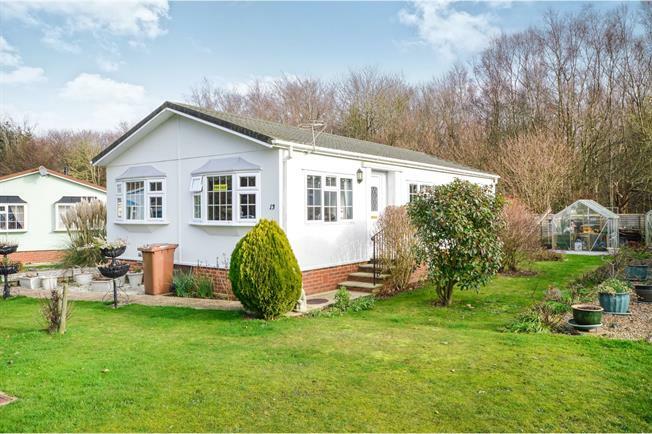 Set in a quiet cul de sac in amongst woodland, offering its own . The property accommodation comprises of a large open plan kitchen/dining room which has been recently fitted, good size living room two double bedrooms of which the master benefits from a shower en suite, and a three piece bathroom. Other benefits include a large wrap around garden which backs onto woodlands and allocated parking. Being one of the larger park homes this must be viewed to appreciate. Radiator, ceiling light. Composite work surface, built-in and fitted units, stainless steel sink, integrated oven, integrated hob, overhead extractor. Radiator, part tiled walls, ceiling light. Standard WC, panelled bath with mixer tap, shower over bath, pedestal sink with mixer tap. Double bedroom; radiator, carpeted flooring, built-in storage cupboard, ceiling light. Carpeted flooring, ceiling light. Standard WC, single enclosure shower, pedestal sink. Double bedroom; radiator, carpeted flooring, ceiling light.